We learned nearly everything there was to know about the i8 Roadster during its debut at the 2017 LA Auto Show in November—except its price. Now, thanks to new information published on BMW’s media site, we know exactly how much financial green the new droptop will command when it arrives at dealers later this year. Like the i8 Coupe, the Roadster is priced far and above its displacement and performance relative to competitors, starting at $163,300. That's a $15,000 premium over the i8 Coupe, which starts at $147,500 for the updated 2019 model. BMW's eco-minded "supercar" received a mild boost in performance for 2019, which got a juiced up electric motor producing 141 horsepower (from 129) and 184 lb-ft of torque. 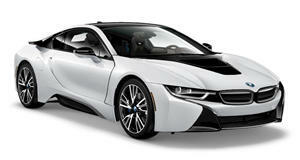 The i8's the three-cylinder turbo engine stands pat at 228 hp and 236 lb-ft of torque. Working in concert, the two powerplants are rated at a combined 369 hp—12 more than the outgoing model. It’s not enough to embarrass a Bugatti Chiron, but it'll launch the i8 to 60 mph in 4.2 seconds for the Coupe and 4.4 for the Roadster. For hypermilers and electric creepers, the i8's battery grows in capacity to 11.6 kWh (up from 7.1), enabling the car to drive an extra 3 miles—18 miles in total—on pure electric power. Digging deeper into the price sheet, we also fine what it will cost to put some finishing touches on the i8. Crystal White Pearl Metallic paint with either Frozen Gray or Frozen Blue accents will set you back an extra $1,800 on both the Coupe and Roadster. The unique Tera World packages run $2,500 for Roadster models or $3,700 for Coupes. Those packages add black brake calipers, leather engine cover, headliner in anthracite and ceramic controls, plus copper or brown leather and cloth accents. The only other options are a couple of no-charge wheel packages and $6,300 laser lights. Destination will tack on another $995 charge.